Cornmeal Crepes, Buttermilk Ricotta and Boozy Gin-Balsamic Strawberries. 1. The night before or about three to four hours before serving the crepes, make the ricotta and the strawberries. 2. Ricotta: Line a seive with cheesecloth and set over a large mixing bowl. Heat the buttermilk and lemon juice over medium heat until the milk starts to separate with clear liquid at the top. Do not stir. Using a candy or a pocket thermometer, heat to 95 degrees. Turn the heat down to low and let the temperature come to 100 degrees. Remove from heat and set aside for five minutes, no stirring. Carefully pour the mixture through the cheesecloth into the bowl and let drain for at least three hours, or until cheese is as creamy as desired. Combine with powdered sugar and refrigerate until use. 3. 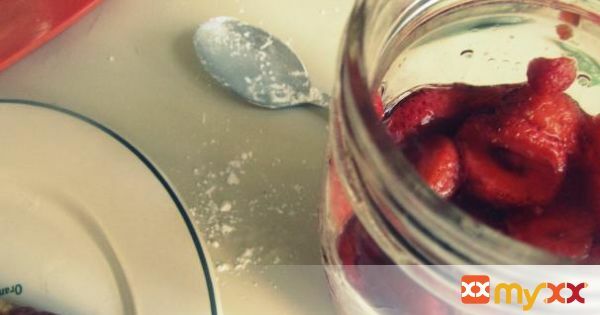 Strawberries: Combine strawberries, sugar, gin and vinegar in a bowl and let sit at least three hours to macerate. The mixture will break down into a lot of liquid; I like to put it all into a jar and give it a gentle shake from time to time as I’m waiting for it to get ready. Refrigerate until use. 4. Crepes: Combine flour, cornmeal, baking soda and salt and whisk to mix. In a separate, large bowl, whisk the eggs, skim milk, buttermilk, honey and canola. Slowly add the dry ingredients to the wet, whisking well to remove any lumps. Cover the bowl with plastic wrap and set aside at room temperature for at least twenty minutes. Heat a small crepe pan over medium heat. Coat the bottom of the pan with a small pat of butter, swirling the butter around as it melts to all sides of the pan. When the pan is hot, carefully pour in about 1/4 cup crepe batter and swirl around the pan to get an even crepe. Run a soft spatula carefully underneath the crepes so they don’t stick to the pan and cook until golden brown, about three to four minutes. Flip the crepe only once. 5. When the crepes are finished, layer the inside with buttermilk ricotta with the strawberries and fold in half. Dust with powdered sugar, and be happy it’s Sunday.